Drop the eyebrows down so that the inside part begins to touch and almost cover the inner part of the eye. Because the inside part is pushing down so much you can even raise up the outer part of the eyebrow a little as you can see in this example image’s left eye. By just adjusting the eyebrows you can see that while the eyes are a little more angry, the facial expression as a whole has taken on a more determined, cocky or confident look. We’ll keep pushing this expression drawing though to get him more angry in the next step by working with the mouth. 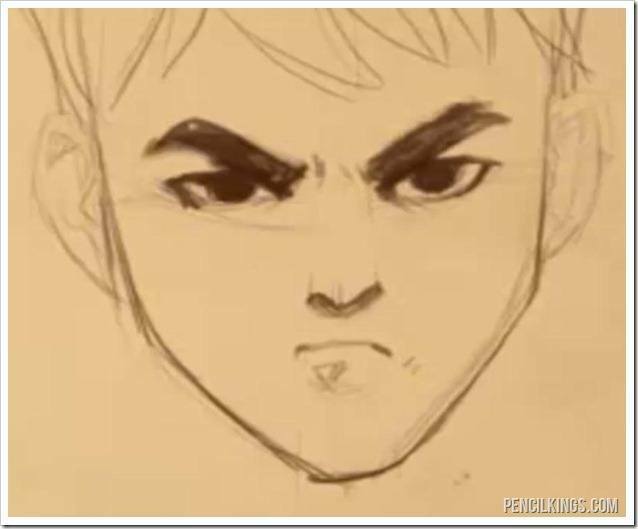 While you are learning about how to draw an angry face and other expressions, you should really take note of what each individual change is doing to the expression as a whole. By noticing all these small differences you’ll have a wealth of knowledge to draw upon whenever you approach another character that needs an expression drawn on his or her face. 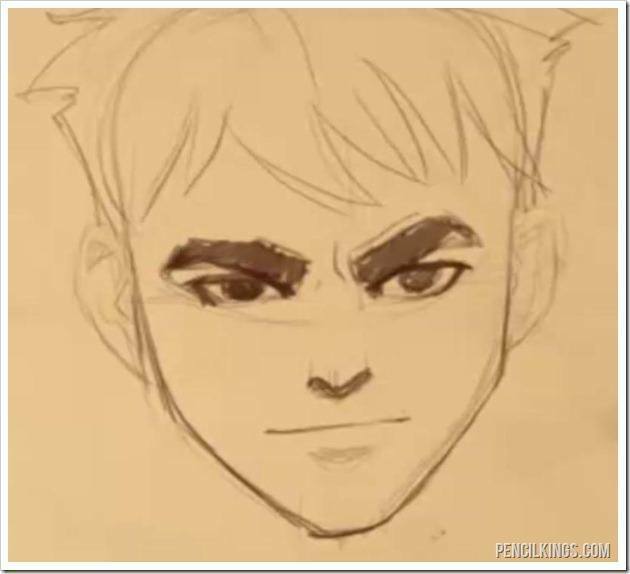 For the final part of our lesson on how to draw an angry face, we’re going to add a few lines inbetween the eyebrows to show the creases that naturally form as the brows start to turn inward and down. You can also add some shading to the top of the eyelids where the eyebrows are touching them to really enhance the intense look of the eyes. Pull the sides of the mouth inward. This is going to have the opposite effect of the smile, and because the lips are being pushed inward, they are also going to start pushing outward. This is a similar effect that you would see when you pucker your lips into a kiss. This puckered mouth will create more shadow and also make the lips appear thicker. This is a really fun expression to play with when you are looking at yourself in the mirror. Try to see how many variations you can get of the angry mouth expression. 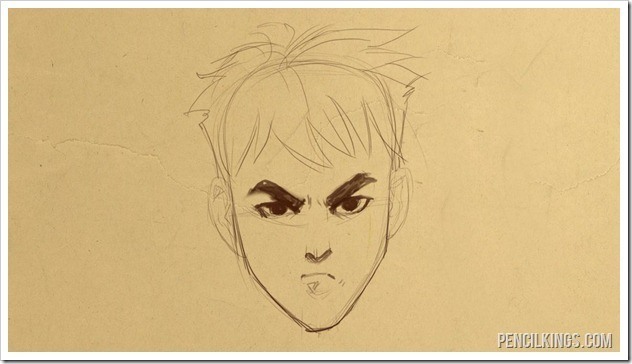 Now that you know how to draw an angry face, why not turn it up a notch and learn how to draw a furious expression? That’s what’s coming up in the next lesson.